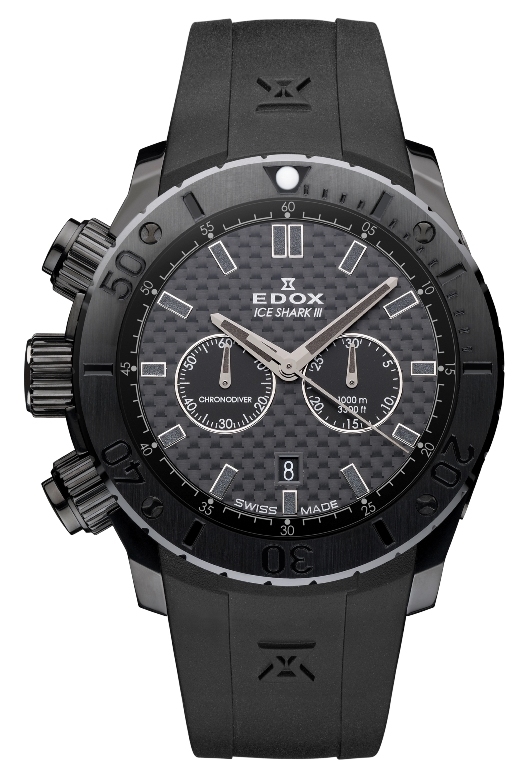 The new Limited Edition Edox Iceshark III is no ordinary diver. This extraordinary watch was designed specifically for the most demanding type of diving on earth: free-diving, diving under the ice. Edox has partnered with world champion ice diver Christian Redl to make the Edox Iceshark III the best ice diving watch ever produced. Christian Redl has already set two world distance records under the ice. He has gone 90m meters with fins and 150 meters aided by a scooter. Under these extreme conditions, it is no surprise that Christian has selected the Iceshark III as his underwater companion. This 45mm diver has been optimized for use underwater. With convenient, left facing pushers and a clean, easily readable graphite colored carbon fiber dial, this rugged timepiece is fully functional, even when wearing a wetsuit. The watch is water resistant to an amazing 3300 feet, featuring a stealthy, black PVD case constructed of super strong 316L stainless steel. With its unidirectional black ceramic rotating bezel and two high visibility subdials at 3 and 9 o’clock for timing events, the Iceshark III makes it almost effortless to determine exactly how much time you have left at virtually any depth. Even under even the most severe conditions, this watch won’t let you down. The Iceshark III is powered by a proprietary Edox 103 quartz movement, based on the reliable Ronda 5021D. This spectacular limited edition timepiece has been fitted with a comfortable black caoutchouc strap and matching PVD coated steel buckle. You may not be a champion diver like Christian Redl, but if you love life on, and under, the water. You’ll appreciate a watch that accepts no compromise. Production of the Edox Ice Shark III has been strictly limited to 250 pieces, each accompanied by a certificate of authenticity and a beautiful presentation box. If you’d like to put one of these technological marvels on your own wrist, you’ll have to act fast. To reserve your Ice Shark III Limited Edition Chronometer, contact your authorized Edox dealer immediately.